Do you have some fence lines on your property that need some beautification and you are not quite sure what to do with them? Well, how about using some roses to add beautiful foliage and color to those fences? Training roses on a fence is easy and beautiful. For tall chain link fences, attach a climbing rose to the fence to help hide the fence and add beauty to it. Plant the climbing rose bushes up close to the fence to grow up the fence easily and use it for support. Space the climbing rose bushes out at 6 to 7 foot intervals along the fence, as this gives them room to grow and spread out their long canes. The long canes can be supported and trained by tying them off to the chain link fence. Be sure to keep the canes tied off in the directions you want them to go, as it will not take long for the canes to grow out of control, thus making a beautiful flow of blooms on the trained canes very difficult to achieve. Climbers may be used on the privacy type wooden pickets and support rails fences also. To train, support and tie off the canes for these fences use nails or screws long enough to go through the wooden pickets and into the wooden support rails for the fence. The weight of the long canes with full foliage and blooms will soon become too heavy for any fastener that is only anchored to the wooden pickets in the fence, thus the fastener will pull out, sometimes splitting the picket. For wooden picket fences, shrub roses can fit the need as well. Planting some shrub roses such as the Knock Out family of roses, some David Austin English type shrub roses or some other type of shrub rose can really spruce things up beautifully. The shrub roses do not need the fence for actual support but rather their strong canes grow up along it and out from it to make beautiful blooming works of art. I would suggest planting the shrub roses out away from the fence line approximately 2 to 3 feet. This will allow the shrub rose to grow up into well-formed full rose bushes. A row of pink blooming Mary Rose David Austin rose bushes can be very beautiful as well as filling the air around them with their wonderful fragrance. 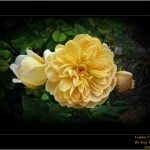 Or perhaps a fence line bordered by some Crown Princess Margareta shrub rose bushes with their beautiful deep golden apricot blooms not to mention the fragrance of her blooms as well. Makes one smile just thinking about it doesn’t it? Split rail and shorter fence lines can be beautifully dressed up with floribunda rose bushes planted alongside them at 30- to 36-inch spacing. 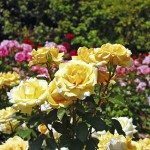 Alternating red and yellow blooming rose bushes or pink and white rose bushes can make for a gorgeous sight. I have seen split rail fence lines with red Knock Out or Winnipeg Parks rose bushes planted nearly under the bottom rail. The bushes grow up and around the bottom rail as well as engulfing the top rail(s) making for a particularly beautiful border to the yard they are in.